A person aspiring to corporate America’s highest heights has no shortage of information purporting to show her the way there. Magazines such as Fortune show top executives striking heroic poses, accompanied by glowing case studies of their career trajectories. The media analyze CEOs’ exercise habits, their diets, and the number of hours they spend sleeping. They ask executives to recount their best decisions and their biggest regrets. Even terrible CEOs get scrutinized for lessons to draw about what not to do. The Big Question: How can you become a better leader? But much of the information can be contradictory. Take the best-selling book Good to Great: Why Some Companies Make the Leap . . . and Others Don’t by management consultant Jim Collins. First published in 2001, it profiles 11 companies that went from 15 years of cumulative stock returns at or below the general market to 15 years of cumulative returns of at least three times the general market. Collins defines a great CEO—a “Level 5 Leader,” in his terminology—as someone with humility, will, “unwavering resolve,” and the tendency to give credit to others and accept blame. The author cites David Packard, the cofounder of Hewlett-Packard, as a praise-worthy CEO: Packard was so self-effacing that he and his wife continued to live in the same small house they had built before he became a billionaire. Another best-selling business book, 2007’s True North: Discover Your Authentic Leadership, prioritizes interpersonal skills. Coauthored by former Medtronic CEO Bill George, True North advocates that CEOs “establish long-term, meaningful relationships.” Its “Personal Leadership Development Plan” encompasses five key areas: knowing your authentic self, defining your values and leadership principles, understanding your motivations, building your support team, and staying grounded by integrating all aspects of your life. The advice offered to leaders and aspirants is often anecdotal, based on observation and experience. What could you learn by stripping that away and focusing on objective measurements of what makes a leader? Chicago Booth’s Steve Kaplan and Copenhagen Business School’s Morten Sørensen reviewed more than 2,600 detailed profiles of candidates for CEO, CFO, COO, and other top positions. From those, they developed a list of skills—four crucial factors—that they say statistically determine who will become a CEO. Kaplan and Sørensen’s study stands out as one of the most comprehensive and systematic leadership analyses to date. It follows up on an earlier study, published in 2012 with Mark M. Klebanov, a Chicago Booth PhD graduate now at Lord, Abbett & Co., an investment management firm. In that work, the researchers reviewed reports from 316 interviews conducted by ghSMART, a firm that assesses top executives, usually when they are candidates for managerial positions. Unlike a recruiting firm, ghSMART does not recommend candidates to interview or receive a fee based on whether a particular executive is hired. The researchers needed to simplify ghSMART’s model for it to have predictive power. With 30 variables, it’s likely that some of those will be strongly correlated, making it difficult to reach valid statistical conclusions. An executive may score highly on speed and enthusiasm and aggressiveness, and the nuances of each may be difficult to separate. So the researchers used a method known as factor analysis to determine which variables tended to move together, compressing the 30 variables into two—the first two factors Kaplan and Sørensen determined as common to CEOs. Later, ghSMART made five more years’ worth of data available, from another 2,300 executive assessments, which drew from a larger pool of candidates for both CEO and non-CEO positions. In that data set, 31 percent of the candidates were considered for CEO positions, 13 percent were evaluated for CFO jobs, and 6 percent for COO. The companies seeking to hire the executives varied from publicly traded firms, to those owned by venture capital or private equity, to other privately owned companies. The additional data gave the researchers the statistical power to reliably estimate two additional factors. To see if those four factors could predict who later became a CEO or another member of the C-suite, Kaplan and Sørensen tracked the executives’ ensuing career paths using LinkedIn and other public sources. They looked to see whether the candidates were hired for the positions for which they were being considered, but also whether those candidates became top executives, especially CEOs, at any company. It is possible to forecast who will earn the top job, they find. CEO candidates who were hired tended to have higher scores in all four areas. And non-CEO candidates who scored higher on those factors were more likely to become CEOs. The initial study finds that CEO characteristics are best explained by overall talent and execution skills. The second data set identifies the importance of charisma and a mixture of creativity and strategy. To achieve a spot in the C-suite, it helps to do a lot of things well. If you have high standards, honor your commitments, work efficiently, have a large network, and are aggressive, fast, and proactive, that’s all good. Being proactive is particularly important because, of all the traits assessed, proactivity makes the largest contribution to general ability. The ghSMART interviewers can’t simply ask candidates if they are proactive, as all the candidates would say yes. Instead, the interviewers get the candidates to tell stories about jobs they have held. From those responses, they gauge whether a candidate acts without instruction, regularly brings new ideas to a company, and is self-directed, according to ghSMART’s interviewing guidelines. Another of the 30 traits linked to general ability is having high standards: expecting both personal and team performance to be the best. Candidates with high general ability also are efficient, able to produce significant output with minimal wasted effort. They honor their commitments, living up to verbal and written agreements regardless of personal cost. They take action quickly without getting bogged down by obstacles. In their 2012 study, Kaplan, Klebanov, and Sørensen looked at CEO performance for companies involved in a buyout by a private-equity firm. They find that CEOs with greater overall talent were more successful, as measured in three ways: the private-equity company’s assessment of the CEO; public metrics, such as whether the CEO led the company to an initial public offering or sale to another business; and a broad measure of whether the company received positive press or additional financing. Their findings on general ability dovetail with a theory developed three decades earlier by the late Sherwin Rosen, the former chairman of the economics department at the University of Chicago. In his work on “superstars,” Rosen argued that market size and reward are disproportionately directed toward the most talented people in an industry, from live comedy to classical music to sports. “In certain kinds of economic activity there is concentration of output among a few individuals, marked skewness in the associated distributions of income, and very large rewards at the top,” he wrote. Similarly, in a 2008 study, Xavier Gabaix of New York University and Augustin Landier of the Toulouse School of Economics find a small dispersion in CEO talent, but they argue that the limited range in overall ability justifies big differences in pay as companies have dramatically increased their market size, thereby increasing the financial weight of CEOs’ decisions. The second important factor in the 30 characteristics: execution, which represents the ability to be efficient, aggressive, persistent, and proactive. There seems to be an important trade-off: the researchers find that execution and interpersonal skills are negatively correlated. More specifically, those who are strong in execution score lower in the ghSMART assessments in categories such as treating people with respect, being open to criticism, listening, and working in a team. Consistent with this, executives who scored higher on execution also were less likely to be considered a nice person by the research assistants who coded the assessments. One of the newly identified factors is charisma, which is associated with enthusiasm, persuasiveness, moving fast, and being aggressive and proactive. Charismatic executives are likely to be classified as more extroverted and better at sales, according to Kaplan and Sørensen. These candidates scored lower on traits that may seem admirable on their own but make a person less likely to become a CEO. These include analytical skills, measured in ghSMART assessments by how often a candidate cited examples of problem-solving skills and discussed processing qualitative or quantitative data. Another trait that can be missing in charismatic candidates is attention to detail: an emphasis on reviewing the minor features of a project. Such skills might make you a better bureaucrat, administrator, or careful middle manager, but they aren’t the ones that are likely to propel you to the CEO job. But Kaplan and Sørensen aren’t the only researchers to recently develop a more favorable view of charisma. Bangor University’s Stephan A. Boehm, Rutgers University’s David J.G. Dwertmann, Heike Bruch of the University of St. Gallen, and the late Boas Shamir of the Hebrew University of Jerusalem examined the performance of 150 German companies, which they measured by company growth, financial performance, and return on assets. Charismatic CEOs boost company performance indirectly in two ways, they find. First, they help create a “transformational leadership climate,” one in which all managers, from the top down, are able to get employees committed to a shared vision of success. Second, charismatic CEOs increase “organizational identity strength.” Employees led by such CEOs are more likely to agree that their company has carved out a significant position in their industry. In other words, when frontline workers share the CEO’s goals and regard their company as an industry leader, it helps the bottom line. The fourth factor is twofold: creativity and strategy. The factor appears to be broader, judging from the data, than either creativity or strategy alone, encompassing elements of both. Individuals who scored well in this area ranked high in traits such as strategy, brainpower, analytical skills, and creativity. Strategy, in the ghSMART assessment, relates to being able to see and communicate the big picture to others in an inspiring way. Creativity is measured by an ability to generate new and innovative approaches to problems. Candidates with high scores on this factor tended to score lower in attention to detail and organization. People who scored especially high in charisma also scored lower on those two traits. In the ghSMART interview, organization is associated with planning, organizing, scheduling, and budgeting in an efficient, productive manner. Translation: the CEO may have lots of good traits, but is probably not spending her time planning the office holiday party. For those with weak creative muscles, Davis says it’s possible to develop them through practice. The first step involves collecting information—some directly related to the topic being studied, and some that at first may seem tangential, but that may serve to generate ideas. The next step involves sifting and sorting through all the information gathered to recognize what connections exist. Those connections lead to ideas. A creative CEO can set the tone for the entire organization. An executive who wants to encourage creativity needs to carefully avoid squelching discussion by being too quick to demand data or evidence from others, says Davis. Executives, he says, need to facilitate meetings to generate rather than criticize ideas—and to keep an open mind as to which ideas are worth exploring further. Whether or not the four factors fit the popular perception of an executive, the researchers find most C-suite members embody the characteristics associated with them, to varying degrees. CEOs tended to be strongest in all four areas. CFOs displayed less charisma and less strategic or creative skill. 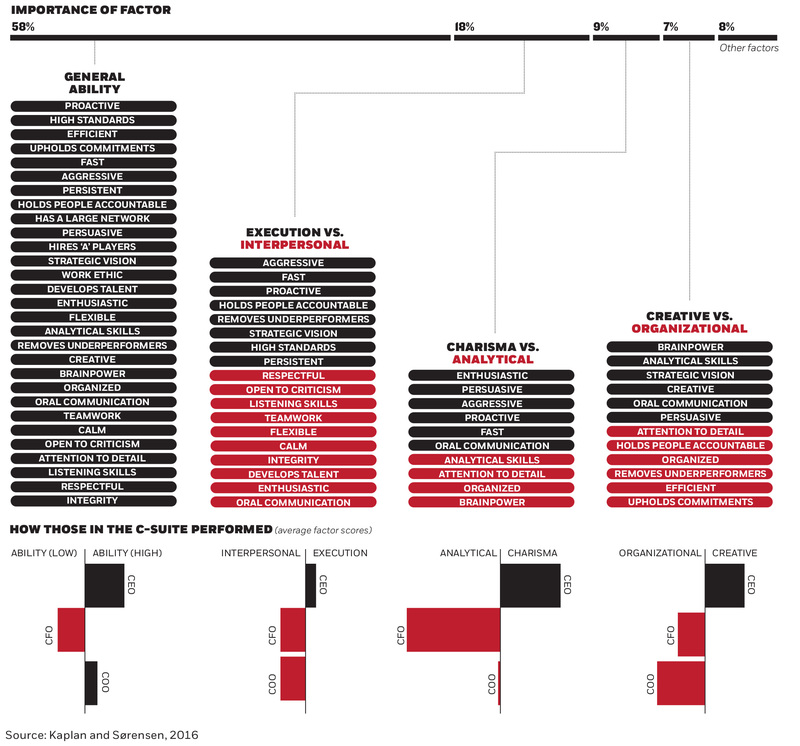 COOs, for their part, showed more charisma than CFOs but were weaker in strategy and creativity. Bill George, now at Harvard, prioritizes the interpersonal skills that Kaplan and Sørensen find to be less predictive of becoming a CEO. George describes “authentic leaders” as those who “engender trust and develop genuine connections with others . . . . [T]hey are more concerned about serving others than they are about their own success or recognition.” George says he doesn’t agree with the analytical methods of the study, or its conclusions. “Effective leadership requires first-person interviews, which this study does not use,” he says. Granted, Kaplan and Sørensen’s research addresses the traits exhibited by people who get to the C-suite; the two haven’t yet focused on the traits needed to excel once in the C-suite. But their earlier research suggests that talent and execution—not humility or interpersonal skills—are important once on the job. The findings do seem to be in line with advice by the late management guru Peter F. Drucker, who in 1967 published The Effective Executive: The Definitive Guide to Getting the Right Things Done. According to Drucker, successful business leaders manage their time well, choose what to contribute to their organizations, know when and where to mobilize their strengths for the greatest effect, set the right priorities, and make effective decisions. All of these traits, Kaplan notes, relate to execution, even though Drucker reached his conclusions by a very different route—talking to people and observing. Stanford’s Jeffrey Pfeffer is another student of CEO behavior whose understanding of management seems to align with the study data. In a new book, Leadership BS: Fixing Workplaces and Careers One Truth at a Time, Pfeffer asserts that a focus on soft skills undermines business performance. “One of the qualities I would look for in an aspiring leader is if the individual is psychologically tough enough to handle not being liked and the responsibilities that come with power,” Pfeffer says in a promotional interview for his book. Empirical and anecdotal evidence can, of course, be complementary. Kaplan and Sørensen asked research assistants who reviewed the executive assessments to evaluate the candidates based only on the qualitative descriptions of their behavior. The assistants rated whether the executive seemed like a nice person, was a risk taker, had an outgoing personality, was good at sales, and had a narrow or broad career path. Overall, the results line up. CEO candidates who are perceived as greater risk takers score significantly higher on Kaplan and Sørensen’s four factors. For CEOs, aspiring CEOs, or corporate board members responsible for hiring decisions, data about leadership provide something novel to consider—and potentially act upon. Creativity and strategy may be innate traits, or at least difficult to develop, Kaplan suggests. But charisma and enthusiasm, and the ability to persuade others, may be more malleable. The data-driven findings suggest that execution skills are an important way that CEOs set themselves apart from the pack, and it’s possible that those abilities can be honed. “It seems plausible that executives can improve execution skills—being more persistent, efficient, and proactive,” Kaplan and Sørensen write. For executives determined to reach the C-suite, the findings are an invitation to dust off the to-do list, and get started. Researchers took 30 traits assessed by ghSMART in executive interviews and condensed them into four critical factors. They also identified three factors that some C-suite executives tend to lack. Stephan A. Boehm, David J.G. Dwertmann, Heike Bruch, and Boas Shamir, “The Missing Link? Investigating Organizational Identity Strength and Transformational Leadership Climate as Mechanisms That Connect CEO Charisma with Firm Performance,” Leadership Quarterly, April 2015. Peter F. Drucker, The Effective Executive: The Definitive Guide to Getting the Right Things Done, New York: Harper & Row, 1967. Xavier Gabaix and Augustin Landier, “Why Has CEO Pay Increased So Much?” Quarterly Journal of Economics, February 2008. Steve Kaplan, Mark M. Klebanov, and Morten Sørensen, “Which CEO Characteristics and Abilities Matter?” Journal of Finance, June 2012. Steve Kaplan and Morten Sørensen, “Are CEOs Different? Characteristics of Top Managers,” Working paper, February 2016. Rakesh Khurana, Searching for a Corporate Savior: The Irrational Quest for Charismatic CEOs, Princeton: Princeton University Press, 2002. Jeffrey Pfeffer, Leadership BS: Fixing Workplaces and Careers One Truth at a Time, New York: Harper Business, 2015. Sherwin Rosen, “The Economics of Superstars,” American Economic Review, December 1981. Geoff Smart and Randy Street, Who: The A Method for Hiring, New York: Ballantine, 2008. Brad Stone, The Everything Store: Jeff Bezos and the Age of Amazon, New York: Little, Brown, 2013.